Straight teeth are essential to a beautiful smile. They are also important for the overall health of your mouth. Crooked teeth are at greater risk for plaque buildup and decay because they are harder to properly brush and floss. If your smile is diminished by the improper alignment of your teeth, we have the ultimate solution: Invisalign Clear Braces. It’s about more than aesthetics — crooked teeth are at much greater risk for plaque buildup and decay. With Invisalign, you can have the straight, perfect teeth you want without sacrificing your appearance. No one will even know you’re wearing braces. 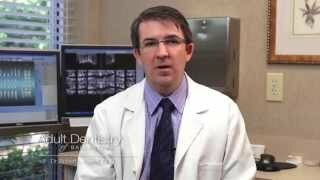 Invisalign braces are much more comfortable than metal braces. There is very little irritation to the lips, cheeks and gums. You can remove your Invisalign clear braces to eat, brush and floss. Invisalign braces are a snap to clean since you can brush or soak them with ease. Invisalign braces work much faster than traditional braces so the treatment period is significantly shorter. In many cases, less than a year is needed. 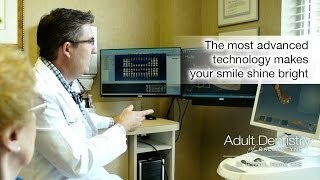 We begin the tooth straightening process by taking digital impressions of your teeth with the CEREC Omnicam. This camera captures full-color, 3D video of the oral cavity. As the camera moves over the teeth we can see every detail with great clarity. The CEREC Omnicam provides the image capture data we use to create your teeth aligners. Invisalign treatment consists of wearing a series of custom-made aligners that correct the teeth a little at a time. With the aid of the AcceleDent Aura, the individual aligners are only worn for approximately one week each. They can easily be removed for eating, brushing and flossing, but are worn at all other times. 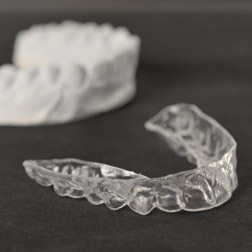 The aligners are uniquely crafted to gradually push the teeth in a given direction, with each new aligner building on the work of the previous, until the desired effect is achieved. In the past, wearing braces meant several years of treatment, along with lip and gum irritation, food particles lodged in brackets and many other annoyances. With Invisalign, patients need not worry about any of these problems. The aligners are thin and completely safe and comfortable in the mouth. Since they are removed when eating or brushing, they are much easier to keep clean. And, because they are clear, most people won’t even know you’re wearing aligners. Many Invisalign patients complete their teeth straightening treatment in a year or less. Invisalign is one of the most effective methods for perfecting your smile. Contact Adult Dentistry of Ballantyne today to start your treatment. Call 704-541-9888 or use the contact form on this page to schedule your first visit. Cut your Invisalign treatment time by 50% with AcceleDent Aura — INCLUDED with your Invisalign treatment! Using the AcceleDent Aura for just 20 minutes each day will gently speed up the movement of your teeth. The secret is SoftPulse Technology, precisely calibrated vibrations that facilitate remodeling of the bone around the teeth for faster alignment. Now is the time to begin your treatment. We’ll take $500 off the regular price for Invisalign, give you a free Acceledent device to cut your treatment time in half ($400 value), and provide a free take-home system for touch-ups ($300 value). Schedule your Invisalign appointment today and take advantage of this special offer.